A HUMAN PERSPECTIVE Songs have been written celebrating April in Paris. Springtime there is mild, with temperatures in the 50°F range. But no songs have been written about April in Winnipeg, Canada. Temperatures in April there are only slightly above freezing. If you look at the two locations on a map, you will find the cities are almost the same distance north of the equator. To understand why two cities at the same latitude are so different, you need to understand climate regions. When studying climate, one of the key words is location. Climate regions act like a code that tells geographers much about an area without giving many local details. To define a climate region, geographers must make generalizations about what the typical weather conditions are like over many years in a location. The two most significant factors in defining different climates are temperature and precipitation. A place’s location on a continent, its topography, and its elevation may also have an impact on the climate. Geographers use a variety of methods to describe climate patterns. The most common method uses latitude to help define the climate. There are five general climate regions: tropical (low latitude), dry, mid-latitude, high latitude, and highland. Dry and highland climates occur at several different latitudes. Within the five regions, there are variations that geographers divide into smaller zones. Although the map shows a distinct line between each of the climate regions, in reality there are transition zones between the regions. 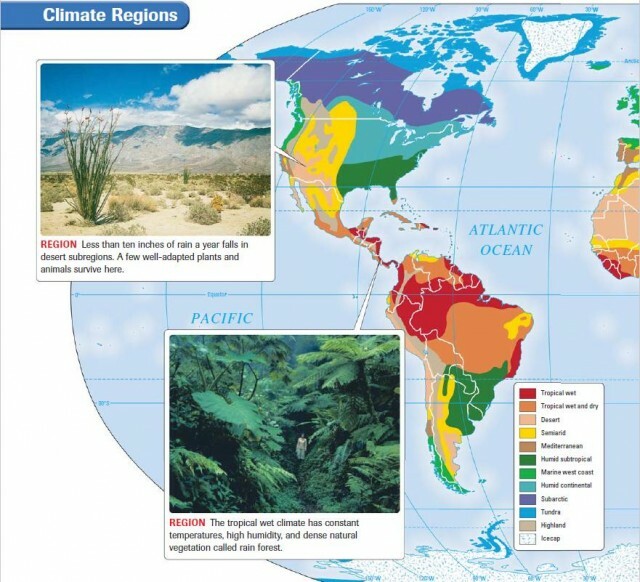 As you read about climate regions, refer to the climate map. You should see the latitude-related patterns that emerge in world climate regions. World climates are generally divided into five large regions: tropical, dry, mid-latitude, high latitude, and highland. The regions are divided into smaller subregions that are described below. This subregion has little variation in temperature over the year—it is always hot, with an average temperature of 80°F. The days begin sunny but by afternoon have clouded up, and rain falls almost daily. The average amount of rain in a year is more than 80 inches. Tropical wet climates are found in Central and South America as well as Africa and Southwest Asia. This climate is called “tropical wet and dry” because the subregion has a rainy season in summer and a dry season in winter. Temperatures are cooler in the dry season and warmer in the wet season. Rainfall is less than in the tropical wet climate subregion and occurs mostly in the wet season. 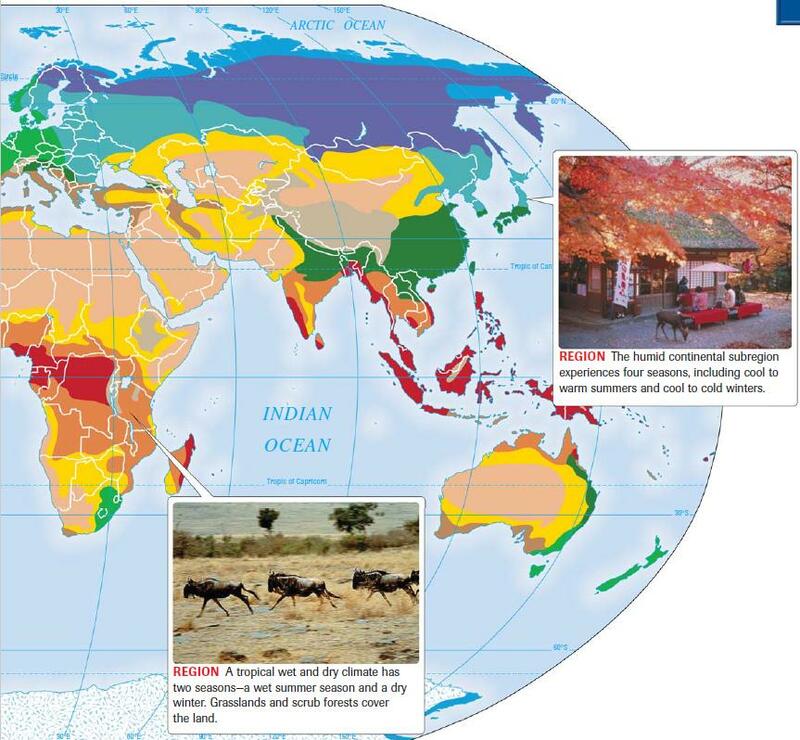 Tropical wet and dry climates are found next to tropical wet climates in Africa, South and Central America, and parts of Asia. This climate subregion does receive precipitation, just not very much: about 16 inches per year. Summers are hot. Winters are mild to cold, and some semiarid locations can produce snow. The climate is found in the interior of continents, or in a zone around deserts. The region contains some of the most productive agricultural lands in the world. Some people think a desert is nothing but sand dunes. However, deserts are categorized according to the amount of rainfall, rather than by landforms, and can be hot or cool/cold. Deserts receive less than ten inches of rain per year. Hot deserts, like the Sahara and the Arabian Desert, regularly have low humidity and high temperatures during the day. At night, temperatures drop because the dry air cannot hold heat well. Cool/cold deserts are found in the mid-latitudes mostly in the Northern Hemisphere, often in the rain shadow of nearby mountain ranges. Summer temperatures are warm to hot, and winter temperatures range from quite cool to below freezing. This climate subregion is named for the land around the Mediterranean Sea where it is located. It also exists elsewhere, such as the west coast of the United States and parts of Australia. Its summers are dry and hot, and its winters cool and rainy. This climate region supports a dense population and rich agricultural activity. This climate subregion, which is located close to the ocean, is frequently cloudy, foggy, and damp. The winds over the warm ocean moderate the temperatures and keep them relatively constant. Parts of the west coast of the United States and Canada and most of Western Europe experience this climate. Precipitation in marine west coast climate regions is evenly distributed throughout the year. Industrial regions with marine west coast climate may have smog (a mixture of smoke and fog). Long periods of summer heat and humidity characterize the humid subtropics. These areas are found on the east coast of continents and are often subject to hurricanes in late summer and autumn. The southeastern part of the United States and large areas of China are examples. Winters are mild to cool, depending on latitude. The climate is very suitable for raising crops, especially rice. A great variety in temperature and precipitation characterizes this climate, which is found in the mid-latitude interiors of Northern Hemisphere continents. For example, Winnipeg, Manitoba, in Canada is located deep in the North American continent. It has a humid continental climate. Air masses chilled by Arctic ice and snow flow south over these areas and frequently collide with tropical air masses, causing changing weather conditions. These areas experience four seasons. However, the length of each season is determined by the region’s latitude. Evergreen forests called taiga cover the lands in the subarctic subregion, especially in Canada and Russia. Huge temperature variations occur in this subregion between summer and winter. Although the summers are short and cool, the winters are always very cold. Temperatures at freezing or below freezing last five to eight months of the year. The flat, treeless lands forming a ring around the Arctic Ocean are called tundra. The climate subregion is also called tundra. It is almost exclusively located in the Northern Hemisphere. Very little precipitation falls here, usually less than 15 inches per year. The land has permafrost—that is, the subsoil is constantly frozen. In the summer, which lasts for only a few weeks, the temperature may reach slightly above 40°F. Snow, ice, and permanently freezing temperatures characterize the region, which is so cold that it rarely snows. These subregions are sometimes called polar deserts since they receive less than ten inches of precipitation a year. The coldest temperature ever recorded, 128.6°F below zero, was on the ice cap at Vostok, Antarctica. The highlands climate varies with latitude, elevation, other topography, and continental location. In rugged mountain areas such as the Andes of South America, climates can vary based on such factors as whether a slope faces north or south and whether it is exposed to winds carrying moisture. Understanding climate helps you understand about the general weather conditions in an area. In the next section, you will learn about the variety of soils and vegetation on the earth.